A Knee sprain is a tear of any of the four ligaments in the knee. 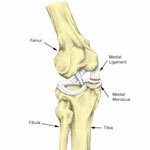 Most common are anterior cruciate ligament and medial ligament sprains. Other sudden onsets, ‘acute knee injuries’ include cartilage meniscus injuries, hamstring and quadriceps tendon strains, and patella dislocation. A knee sprain is a general term that describes a tear to any of the four ligaments in the knee, normally after an impact or twisting movement. Sprains are often complicated and involve damage to more than one ligament and other structures in the joint, including cartilage meniscus, articular cartilage, and the joint capsule. A torn ACL or anterior cruciate ligament sprain is common in contact sports involving quick changes of direction. Symptoms include immediate acute knee pain with swelling that may develop rapidly. The patient may have felt or heard a pop or crack in the joint at the time of injury. Immediate first aid applying the PRICE principles of protection rest, ice, compression, and elevation are important. Surgery to repair the torn ligament is usually indicated, especially with active sports people. 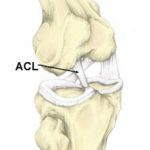 Read more on ACL sprain. An MCL sprain is a tear to the ligament on the inside of the knee joint, caused either by a direct impact to the outside of the knee or twisting. Symptoms include sudden onset pain located on the inside of the knee with rapid swelling Medial knee ligament injuries are graded from one to three depending on the severity and will range from mild tenderness to severe pain and incapacity. 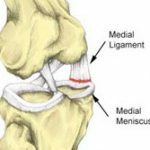 Often MCL sprains occur in conjunction with a medial cartilage meniscus injury. Read more on MCL sprain. 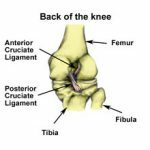 A PCL injury is a tear to the posterior cruciate ligament deep in the knee joint, usually caused by an impact to the front of the knee or twisting. Symptoms include immediate pain which may radiate into the lower leg. There may be swelling but not always along with a feeling of instability. Most PCL sprains are treated conservatively but some may require surgery. Read more on PCL sprain. 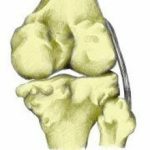 A tear of the cartilage meniscus on the inside of the knee is commonly caused by direct impacts, twisting actions or occasionally develops over time through degeneration. Symptoms include sudden onset pain on the inside of the knee with swelling developing depending on how bad the injury is or whether the medial ligament is also torn. 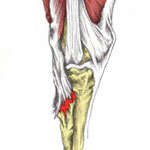 If the injury not so recent then tenderness may be felt along the joint line on the inside of the knee. Read more on Medial meniscus sprain. Tearing the ligament on the outside of the knee can occur after an impact to the inside of the knee (which pushes the knee outwards). The symptoms can vary in severity, and include tenderness on the outside of the knee and pain when applying pressure to the inner knee for a milder injury. Swelling and a feeling of laxity may appear with a more serious injury. Read more on LCL sprain. Pain will be immediate and there is likely to be swelling. 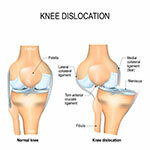 The kneecap may be visibly displaced, although it may dislocate and return back to its original position. The movement of the kneecap will be extremely painful. This knee injury is usually caused by an acute blow or a twisting action. Read more on Patella dislocation. The tendons that insert into the back of the knee can become ruptured (either fully or partially), which can cause a sudden sharp pain at the back of the knee. The area may become swollen and feel sore, and sometimes the area may feel warm. Bending the knee against resistance can reproduce the pain. Read more on Hamstring tendon strain. This occurs when the tendon tears and takes a piece of bone with it. It will cause a sudden sharp pain at the back of the knee which normally prevents you from continuing the activity. Swelling will appear at the point of injury and it will feel tender. The hamstring will likely feel weak and pain will be reproduced when trying to bend the knee against resistance. 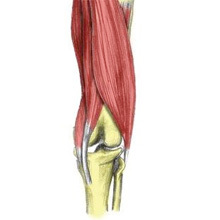 Read more on Biceps femoris tendon avulsion. Often caused by jumping or an explosive load, patella tendon ruptures are very painful. A pop may be heard at the time of injury and there may be swelling, particularly at the bottom of the knee. Putting weight on the knee or straightening the leg will probably be impossible. 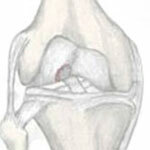 Read more on Patella tendon rupture. A direct impact to the kneecap, such as a fall, will cause sudden pain. Bruising, and possibly swelling, may appear and it may be difficult to walk. 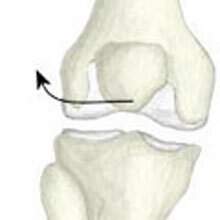 Depending on the severity of the injury, the pain may be localised to the kneecap or spread to the whole joint. 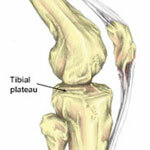 If the impact is particularly severe the patella may become fractured. Read more on Acute patella injury. Otherwise known as a bruised knee, this injury is caused by an impact on the knee. Instant pain and bruising are the main symptoms and the area may feel tender. The symptoms can worsen depending on the severity of the injury. Read more on Knee contusion. This often occurs at the same time as lateral ligament injuries and has similar symptoms to a cartilage meniscus injury. It can be caused by twisting movements and changes of direction. A sharp pain will be felt and the joint line will feel tender, although there is unlikely to be any swelling. The cartilage at the end of the bones can be damaged by a trauma to the knee or alongside other injuries. 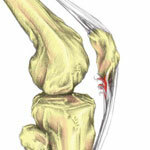 Recurrent knee pain, inflammation, and swelling are the main symptoms, and there may be ‘locking’ in the joint. Read more on Articular cartilage injury. 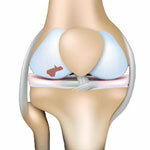 The unhappy triad of the knee involves damage to 3 of the 4 major ligaments in the knee. It normally occurs after a traumatic injury and causes severe pain, rapid swelling, an audible tear at the time of impact and difficulty in moving the knee. Read more on Unhappy triad of the knee. When the thigh bone and shin bone move apart, the knee becomes dislocated which is a very serious injury. Immediate pain, deformity, and rapid swelling and bruising are the main symptoms. It will be impossible to put weight on the leg. Read more on Dislocated knee. Located at the top of the shin bone, the tibial plateau can become fractured in high-speed accidents like a skiing or horse-riding injury. The area has normally been injured before and there will be knee pain and swelling in the joint. This often occurs with other injuries and causes immediate pain at the time of impact, which will get worse when bearing weight. There will also be rapid swelling and the knee joint may lock and feel unstable. All acute knee injuries should be treated using the P.R.I.C.E. principles (protection, rest, ice, compression & elevation). This should be applied at home for at least the first 2 – 3 days. Protect- Keep the knee from suffering further damage. Stop training or playing immediately to prevent the injury from becoming more serious or chronic. Rest – Don’t exercise and try to reduce the demands of your daily activity to encourage recovery. It does not only refer to the period of time that the athlete will be out of action, but also to the immediate period after the injury. The athlete needs to allow the injured area to heal otherwise repetitive minor injuries can often result in a more severe injury. Ice – Applying ice or cold therapy to the knee injury/swelling can reduce the symptoms of pain and inflammation. Compression – The use of compression support or compression bandages on the knee can help reduce swelling. Elevation – Keeping the knee elevated above heart level whenever possible helps to reduce swelling due to the effects of gravity.